Many a cynic can put a dampener on the 1546 honeymoon concept: a positive gateway into married life, describing the first month as the ‘sweetest’. 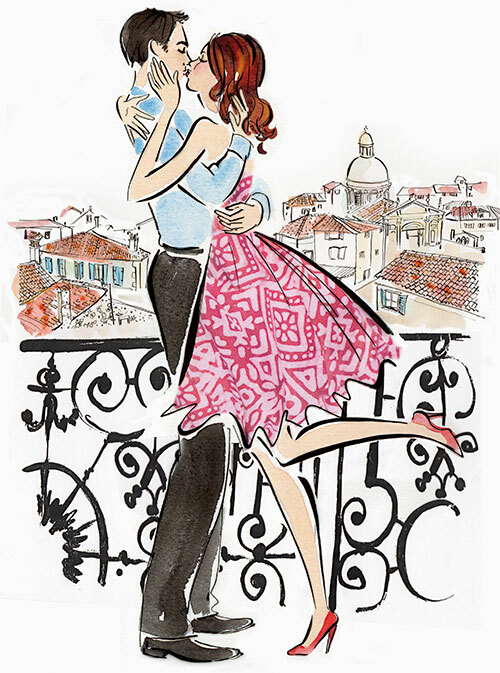 French comedian Pierre Desproges once said, ‘To make sure your honeymoon is a total success, it is best to go alone’. Bien sûr, this advice is best not taken to heart (what does he know, he’s French!). To be honest, the French are not the only ones to question the institution of marriage. A good many of Oscar Wilde’s witticisms are aimed at those who have tied the knot. Being well-prepared for a honeymoon could be as useful as the century-old pikes placed deep in Venetian soil that have managed to hold up those picturesque mansions until today. Once upon a time, moments after an elegant wedding ceremony, the prince and princess were hoisted onto a ‘Just Married’ carriage and driven away to a destination far, far away…. Or at least that’s what the Disney regulars suggest. Yet it actually took place a little differently. There are various theories as to how the concept of the honeymoon originated. The phrase is believed to refer to a sweet fermented drink, or honeyed mead, supposedly increasing the chances of a fertile union if drunk for a month (or ‘moon’) by the bride and groom. Careful though: one of the conjectures of Attila the Hun’s death is a supposed overdose of this very same hydromel at his wedding feast. Not all honeymoon folklore is quite so pleasant. Originally, and especially in Scandinavian countries, it was the period when the groom ‘stole’ the bride away from her family, the bride being a willing accomplice depending on the circumstances. Tradition has it that the couple would hide away (in a damp cave perhaps?) until the bride’s family had given up searching for her, or until she was with child. Today, instead of the prince and princess (or kidnapper and hostage), the sales rep and advertising executive sit down together in front of a calendar and attempt to squeeze a six-day holiday between a job promotion and teeth cleaning. Not exactly the most literal interpretation of the term honeymoon as ‘the sweetest of times’. But indeed in modern-day marital epics, the honeymoon might appear more like a society-driven concept, which goes hand in hand with the expensive flowery-wedding-and-elaborate-dress tradition. Look how well Along Came Polly turned out, poor Ben Stiller, jilted on his honeymoon. Honeymooning has been severely revolutionised, (the notorious phrase ‘the honeymoon’s over’ takes on a whole new meaning in this case). Is it worth going through all the trouble? Earlier, between extremely young newlyweds and arranged marriages, the bride and groom barely knew each other. Whereas today a couple is likely to have been dating for a while before getting married, and are even likelier to have already embarked on many a journey together out of wedlock – my cousin had to deal with being called a ‘libertine’ by her über-conservative grandmother after taking a trip to the Canary Islands with her boyfriend. Has the honeymoon become merely an obligation shaped by today’s society? One might argue that the concept has always been dictated by society (or religion), whether it be the custom that originated in Great Britain, as a model borrowed from the Indian elite, or the early reference to the honeymoon that appears in Deuteronomy, the fifth book of the Hebrew Bible, stating that, ‘When a man is newly wed, he need not go out on a military expedition, nor shall any public duty be imposed on him. He shall be exempt for one year for the sake of his family to bring joy to the wife he has married.’ Now there’s a mot d’ordre to tell your brand new husband to guarantee you a spoiled and pampered time! As couples get married at a later age, they are already involved in time-consuming jobs, making it difficult to cram in quality time after the wedding. Their schedules are not as free as in the past when a honeymoon, or ‘bridal tour’ as they were called, implied a whole year trip to visit family and relatives (contrast that with the now common, shrunk-down B&B weekend honeymoon). This new independence – away from the influence of the in-laws – can lead to a more tailor-made and distinctive trip. No more abductions or long carriage voyages with ill-tempered in-laws. One is free to pick one’s own destination and time. The main objective in any season or era is to make your honeymoon count, because as is written in the Little Giant Encyclopedia of Wedding Toasts, ‘A honeymoon is the short period of doting between dating and debting’. And unlike Elizabeth Taylor, you are probably not planning on having eight of them…. Instead of toasting yourselves by the ocean, why not take a peek underneath it? Not deep sea diving, but close: an underwater honeymoon. If you have ever taken the Eurostar from London to Paris as a child and wondered if you could actually see the fish through the window…this is the occasion to make all those marine life-spotting dreams come true. 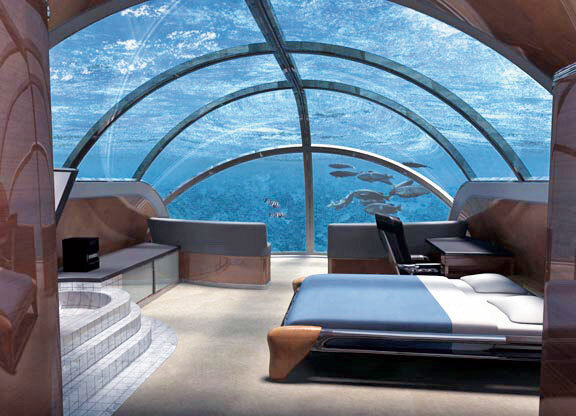 What better way to spend your first vacation together as a married entity than in the complete isolation of a bubble-shaped underwater lodge 20 feet below the surface? This oceanic honeymoon experience is accessible at Key Largo’s Jules’ Undersea Lodge in Florida. You might think that only Americans can cook up such outlandish ideas; nevertheless, another fishy alternative is available at the Hydropolis Underwater Resort Hotel in Dubai, which boasts 220 rooms, as well as two large glass domes containing an underwater ballroom and concert hall. Of course you’ll have to scuba-dive your way into the hotel…. If you don’t like being underneath the surface, how about spending your honeymoon 60 feet in the air? There is something enthralling about getting isolated time with your new partner nestled in a tree high above the ground. There are a surprising number of treehouse hotels in the world: Brazil’s Ariau Amazon Towers Hotel is built entirely at the level of the rainforest canopy, which you can tour via four miles of wooden catwalks perched 70 feet off the ground. It also boasts a unique honeymoon suite. For a more rustic experience, you can try Cedar Creek Treehouse in the Mount Rainier National Park in Washington State, America. This one-room hotel is built next to a stream and perched up on a colossal cedar tree. One of its charming particularities is the massive tree trunk that bursts up through the floor of the kitchen and out through the ceiling. Picture the breathtaking view, remarkable solitude and friendly resident owl. 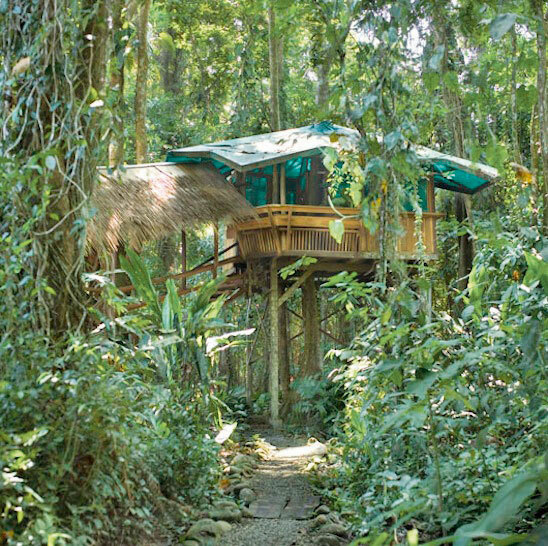 The treehouse honeymoon offers the best setting and scenery a nature-loving couple could experience. Familiar with the expression ‘a man for all seasons’? There is a honeymoon for just one season in particular. If you subscribe to the desire of the snug proximity of a newlywed marriage, pack a blanket or five, and head on to an Ice Hotel. 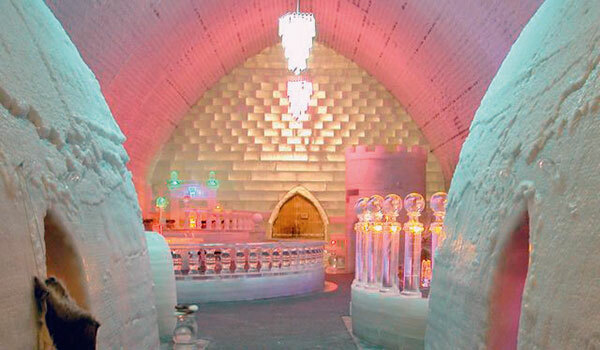 This is, as the name indicates, a hotel entirely erected out of ice and snow, in which everything including beds, benches, and bars, are shaped out of ice-water. Besides the novelty factor, there are a number of activities available, including dog-sledding, playing a pipe organ made out of ice, and drinking vodka shots out of ice-made glasses. However, we do advise against overdoing that last one as midnight bathroom runs might get chilly. 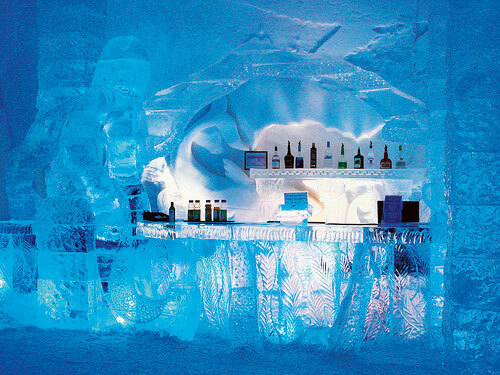 There are at least five Ice Hotels around the world and a wealth of options as to the location: Sweden, Quebec, Greenland, Finland or Alaska. Of course these hotels melt away in spring, so you will have to plan your honeymoon trip accordingly, to avoid it raining on your parade! In the olden days, a honeymoon essentially entailed a trip all over the country in order to visit those who had not made it to the wedding. Interested in reliving tradition? Why not have a train honeymoon, and cozy up in an actual railway wagon? 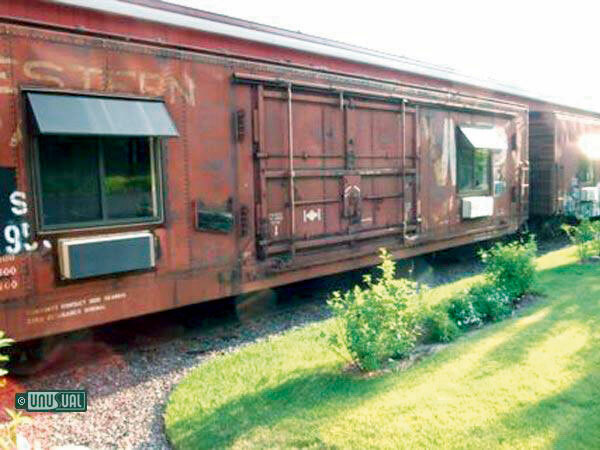 In Two Harbors, Minnesota, America, the Northern Rail Traincar B&B hosts guests in actual connected rail cars, containing 18 guest rooms. You could also go all out and climb aboard the King Conductor Suite, a full train car hosting a king bedroom and separate living room, to kick-start your marriage on the right track. In these fully furnished carriages, surrounded by unsullied nature, one might start to feel the Orient Express charm, conjuring up the romantic spirit of train travel. Might we suggest however not sticking too closely to the Christie novel. Hiding from your in-laws? Think about secreting yourself in a cave: in Cappadocia, Turkey, lies a whole maze of underground hotels. One of these is the Gamirasu Cave Hotel, located inside a thousand-year-old Byzantine monastic sanctuary, inhabited until recently by Christian monks. Enjoy the peace, quiet and coolness of this antique retreat, where each room (most of them ancient monk cells, others built from volcanic rock) is decorated distinctively and boasts traditional Cappadocian furniture. It will transport you centuries back in time, although not so far back as to preclude the introduction of electricity and running water. Many a joke compares marriage to prison – Montaigne actually writes, ‘Marriage is like a cage; one sees the birds outside desperate to get in, and those inside desperate to get out’. It is not our place to determine whether that is true or not, but how about personally seeking out the difference or similarity? Ever thought of serving time while on your honeymoon? This can be done by inhabiting the authentic, out of use Karosta Prison in Latvia. Out of use? Not completely, as guests still play the roles of captives, sleeping in icy iron beds and using toilets that remain dreadfully similar to their original state. 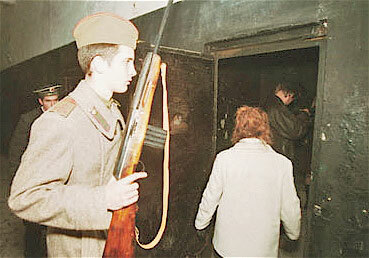 Not to mention the ex-Soviet military guards berating and shouting orders at the ‘prisoners’. For sure, your partner will subsequently never comment on your cooking after sampling a questionable prison meal. What better way to put a newly-founded marriage to the test? ‘Love conquers all’? That is left to be seen!